The name Panama is said to mean “abundance of fish.” Now a new study estimates that between 1950 and 2010, the amount of fish taken from Panama’s waters was so considerable that officials could not keep tabs on more than a third of the catch. The U.S. Coast Guard captured a Costa Rican fishing vessel and arrested three Costa Ricans and one Nicaraguan suspect off the coast of the remote Cocos Island in the Pacific. The boat had 2.3 tons of cocaine on board. The bust went down on Monday with the assistance of local Drug Control Police. Four foreign fishing vessels issued citations so far this year. Canadian fisheries officers continue to board and inspect foreign offshore fishing vessels outside the 200-mile limit — checking for violations of the rules set in place by the Northwest Atlantic Fisheries Organization (NAFO). Small-scale fishermen in Chile have clashed with police after a protest in the port of Valparaiso. Fishermen marched to the Congress on Wednesday to demand improved working conditions and an increase in the amount of cuttlefish they're allowed to catch. As much as 22 percent of the catch in several local fisheries may be wasted, according to a recent report. These are fish caught in nets inadvertently. Different species are brought in with the intended catch and, often because they are not marketable, discarded overboard. When President Obama announced two weeks ago he intended to expand federal protections around seven islands and atolls in the central Pacific Ocean, many environmentalists hailed the move as an important step for conservation. But the main group overseeing fishing operators in Hawaii and three U.S. territories in the region declared Monday it opposes the proposal, on the grounds that it would hurt the U.S. fishing industry. The existence of most Caribbean coral reefs is threatened over the next 20 years without action to stem dramatic declines, conservationists have warned. In response to the White House's recent crackdown on seafood fraud and illegal fishing, Frequentz has announced the expansion of Information Repository & Intelligence Server (IRIS) beyond food, life sciences, and industrial supply chains to include a seafood and sustainability traceability solution. It also covers various global seafood traceability trade and regulatory requirements and is the first market expansion since taking over the platform from IBM. What's the most popular seafood in the U.S.? Shrimp. The average American eats more shrimp per capita than tuna and salmon combined. Most of that shrimp comes from Asia, and most of the salmon we eat is also imported. In fact, 91 percent of the seafood Americans eat comes from abroad, but one-third of the seafood Americans catch gets sold to other countries. Coast Guard crews in South Texas located and recovered a gill net with 65 deceased sharks Monday. At approximately 2:00 p.m., on a routine patrol, an aircrew aboard an HU-25 Falcon airplane spotted floating fishing gear approximately 20 miles off South Padre Island and 37 miles north of the U.S./Mexico maritime border. Bumble Bee Foods is preparing a sale process that could value North America's largest producer and marketer of canned tuna and sardines at as much as $1.5 billion, according to people familiar with the matter. Australian senator Richard Colbeck says Canberra's recently announced update of its Pacific patrol boats programme will help the monitoring of fisheries in the region. As concerns grow for illegal, unreported and unregistered fishing, New Zealand's Pacific Economic Ambassador, Shane Jones, says New Zealand stands ready to provide its expertise in surveillance. Three Forum Fisheries member countries today signed on to the Pacific’s milestone Fisheries Surveillance Treaty (FST), aimed at curbing illegal, unregulated and unreported fishing. Signature of the governments of Australia, Niue and Solomon Islands were added to the FST on the margins of the 10th Ministerial Meeting of the Forum Fisheries Agency (FFA), which comes to a close later today in Tokelau. THE Eastern Cape’s multimillion- rand chokka fishing season reopened yesterday. This follows a three-month, industry-imposed cessation to replenish the chokka – also known as squid – in Eastern Cape waters. Singapore Airlines has decided to make it clear: they like sharks. And they are professing their support by agreeing to stop carrying shark fins on their SIA Cargo flights. The change goes into effect on August 1st. Korea failed to reach an agreement with Japan on the total amount of fishing allowed in each country’s exclusive economic zone (EEZ), the Ministry of Oceans and Fisheries said yesterday. The Pacific’s annual meeting of Fisheries Ministers heads to the region’s smallest island community this weekend, becoming part of a historic moment for Tokelau. Traditional leaders and the close-knit community of Atafu, where ministers and officials are set to make landing this Sunday are going to be welcoming the territory’s first-ever regional gathering of Pacific ministers. Sarah Ivey's exciting and icy ocean frolic with the muscly edibles reveals just how powerful, speedy and incredibly special they are. Royal Australian Navy ship HMAS Parramatta visited Noumea, New Caledonia between Friday 27 and Sunday 29 June before commencing a patrol as part of Operation SOLANIA. The Anzac Class Frigate spent three days in Noumea strengthening relationships with the French Armed Forces New Caledonia (FANC) and promoting multilateral security cooperation. Children's rights are being abused in Africa as they are exploited for slavery and through trafficking. Children are also used in piracy acts off the coast of Somalia. But these are just some of the human rights violations at sea that UK Barrister-at-Law David Hammond is fighting to stop. The global tuna community has recently been shaken up by the EU handing a yellow card on IUU monitoring to the country which has the richest skipjack catching ground: Papua New Guinea. Seafish has made available a report calling for an immediate re-think over the universal ban on driftnet fishing being proposed by the EU in order to help inform wider debate on the topic. The independently authored report, which explores the economic and environmental impacts of the proposed ban, reaches the conclusion that the proposed ban is “unnecessary, heavy handed, disproportionate and inappropriate for UK waters”. The tuna freezer vessel Ljubica has been launched at Zamakona Yards shipyard in Bilbao, Spain, property of the Ecuadoran shipowner Pesquera Miriam. Two East African countries have entered the ranks of the world’s top fishing nations and concerns that the region faces a major decline in fish production due to indiscriminate fishing practices. Mozambique´s National Fishing Administration, INAM, has said foreign and local Mozambican investors have shown interest in setting themselves up in Nampula province to focus on tuna fishing for export, the local media reported on wednesday quoting a governmenent source. A working group comprising representatives from seven countries of the East African coast, including Mozambique, started today in Maputo to discuss strategies to combat illegal fishing in the region, within the multilateral program i-FISH Africa. If a fish falls in the forest and no one is there to hear it … wait, is that not how it goes? Let’s put it this way: If a fishing boat illegally scoops up a load of fish in the middle of the ocean and no one is there to see it, it’s still illegal — but until now there has not been much anyone could do about it. June 25th is the fourth annual International Day of the Seafarer, which is the term applied to anyone who works on a ship. Local authorities are taking the opportunity to highlight the importance of welfare for those in the shipping industry, due to their often difficult and isolated work conditions. Anthony Long, director of the Ending Illegal Fishing Project, explains the scope of the problem and the solutions pursued by his organization. Environmentalists and fishermen rarely agree on anything – despite that, for logical reasons, they should stand shoulder-to-shoulder in a common cause for maintaining ‘sustainable’ utilisation of fishery resources. The rule of law is almost entirely absent, with virtually no governance or policing. Illegal, unreported, and unregulated economic activities are common. The powerful seize non-renewable resources at the expense of the powerless. Environmental degradation is on the rise. The amount of plastic floating on the ocean surface is less than expected according to scientists who have mapped plastic pollution in the world's oceans. The Pew Charitable Trusts has teamed up with a UK satellite technology organisation, coast guard and other fishing enforcement officers to fight Illegal, Unreported and Unregulated (IUU) fishing. 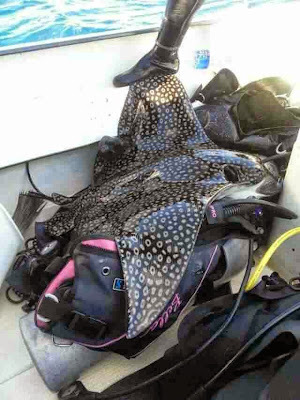 PADI Divemaster Hu Jie Fang was caught illegally killing an eagle ray when he posted the photo to Facebook. The Saipan Tribune reports that a dive operator living in Saipan, CNMI has been found guilty of killing a protected spotted eagle ray and was slapped with six months in prison. The Commonwealth of the Northern Mariana Islands was one of the first places in the world to fully protect all sharks and rays. They have also joined up with their neighbors to create the Micronesia Regional Shark Sanctuary, an area of protected shark habitat in the western Pacific as large as the European Union. Kudos to CNMI Superior Court Associate Judge Joseph N. Camacho for imposing the maximum sentence and making some of the best conservation statements ever spoken from the bench. “The congregation of spotted eagle rays is easily photographed. Each photo taken home with the tourist is free advertising showing the great beauty and grand scale of aquatic life in the CNMI,” said Camacho, citing the findings and purpose of a bill that the Legislature passed in 2008. He said the Legislature further finds that Eagle Ray City is popular with local residents and good for the economy in that it is accessible only by boat; divers (tourists and residents alike) need to hire local guides and secure the services of local boats and captains to reach this spot. “This type of ecotourism is beneficial to the CNMI’s economy, fits within the advertising campaigns offered by the Marianas Visitors Authority, and should be nurtured, protected, and grown,” he said. Camacho said the Legislature finds that evidence suggests the eagle rays have been recently hunted to such an extent as to threaten their population levels and as to instill an unnatural fear of divers, thereby threatening one aspect of the Commonwealth’s revenues. The Legislature finds that spotted eagle rays specifically, and rays generally, are not traditional food fishes in the CNMI. “Fishing specifically for such rays is not a tradition in the CNMI; the recent practice of doing so is detrimental to the welfare of the Commonwealth and should be prohibited…” Camacho said. Camacho said that Fang used a spear gun and shot dead an eagle ray while diving at Eagle Ray City, also known as the Ice Cream Diving Spot. Camacho said Fang is a master diver trained and instructed to respect marine animals. Enforcing shark sanctuaries is not easy. The men and women of enforcement agencies are faced with small budgets, and must protect vast areas. Yet they manage to do amazing work. Thank you for all you do!